Ministers have been urged to cut the drink-drive limit by nearly half in a government-commissioned report. Sir Peter North's review said reducing the limit from 80mg of alcohol per 100ml of blood to 50mg would save hundreds of lives. He also recommends that the current mandatory 12-month driving ban should be maintained for the new 50mg limit. The review was commissioned by Labour and it is not certain that the new government will adopt its findings. Sir Peter, a leading academic and legal expert, makes a total of 51 recommendations in his report. These include making it easier for police to identify and prosecute drug-drivers by allowing nurses, as well as doctors, to authorise blood tests of suspects. The big question with reports like this is will the government act on any of the recommendations? Reviews commissioned by previous governments seem to be particularly prone to being buried in new ministers' filing cabinets. And you'd be forgiven for thinking that scenario is even more likely in this case because of comments made before the election by the then shadow transport secretary Theresa Villiers. She was quite clear in saying that a Conservative government would not reduce the limit to 50mg. But as government insiders point out, we don't have a Conservative government, we have a coalition. They claim that means things have changed, that they need time to consider the 51 recommendations in this "serious work", and that it won't be rejected out of hand. And the timescale for the government's response? "In due course" - plenty of scope there to either accept the recommendations or quietly retire them to that space at the back of the filing cabinet. Based on new research by the National Institute of Health and Clinical Excellence (NICE), Sir Peter said that as many as 168 lives - about 7% of UK road deaths - could be saved by a reduced drink-drive limit in the first year. This could rise to as many as 303 lives by the sixth year, he said. Sir Peter said: "Research conclusively shows the much higher risk posed by drink-driving. "With a blood alcohol level between my proposed new limit of 50mg per 100ml and the current 80mg per 100ml limit, a driver has a six times greater risk of road death than a non-drinking driver. "Having considered the issues carefully and considered views from all quarters, I not only believe that it is right to reduce the limit, but that the public is ready for a lower limit. It is time to give them what they want." He added: "Surveys also tell us that the public is in favour of lengthy bans for drink-drivers and witnesses have told me that the current ban is the major deterrent to drink-driving. "I am therefore clear that the 12-month ban needs to be maintained at a 50mg per 100ml limit." Sir Peter stressed that a driver could still have a drink without infringing the 50mg limit. Transport Secretary Philip Hammond, who saw the report in advance last month, said: "Sir Peter's report is a serious piece of work that covers a wide range of issues. "We will need to carefully consider these with other government departments. Why not ban all drink driving? "In doing so it is important that we fully investigate the economic and public service resource impact of any suggested changes to the law, taking account of the current financial and economic situation. "Our priority will be to tackle drink and drug-driving in the most effective way possible to protect law-abiding road users. We will respond to Sir Peter in due course." Gwent Chief Constable Mick Giannasi, lead on roads policing for the Association of Chief Police Officers, said: "Drink and drug-driving is a significant factor in the unnecessary death of many hundreds of people a year, while thousands more suffer serious injury. "This review contains some key recommendations that will be well received by front-line roads policing officers and help police tackle this problem more effectively." Alan Kennedy, chairman of local authority body Road Safety GB, said the recommendations would bring the UK into line with legislation in many other EU countries. He said: "This is a great opportunity to significantly reduce the number of deaths on our roads and we urge the government to accept the North findings." AA president Edmund King said the motoring organisation was "delighted that these issues are being addressed". "Our members want action on drug-driving and also support a reduction in the drink-drive limit, together with a 12-month ban," he said. Professor Stephen Glaister, director of the RAC Foundation, said: "If those drivers determined to drink excessively feel they can beat the system, then they will. "Whatever the drink-drive limit is, it must be enforced, as lessons learnt from the past demonstrate." 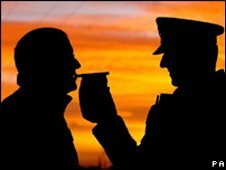 A 50mg limit would bring the UK into line with most of the rest of the EU, but combined with a 12-month ban it would be one of the toughest drink-drive regimes in Europe. Why not ban all drink-driving?